Here’s another release I should have gotten about six months ago. Elwood Emission is one Lucy Kalantari from Brooklyn, NY. Her initial release under the Elwood Emission moniker is a 6-track EP (digital download only) by the title of "Ode to the Ego". Lucy describes her music as "Pat Benatar & Trent Reznor’s love-child, but that seems a bit aggrandizing and not quite on the mark to me. There’s no doubt it does have an industrial flavor, but at the heart of it is a singer-songwriter with a more mainstream background; think Alanis Morrisette, Fiona Apple, Sarah McLachlan, Amy Lee of Evanescence, et al. In fact, Lucy had an "adult contemporary" project called Luciar a while back and I heard a few snippets from that project’s Rules of the Game’ 2000 release, and it was pretty good. If it had gotten the right promotion behind it, it might have really gone somewhere. So the question is, what does a woman from Brooklyn with a lot of musical experience bring to the goth-industrial world? Well, for one thing, a great voice, and some talented songwriting when she really wants to strut her stuff. Her production skills aren’t bad either, for a boudoir studio’. So, what of the songs? Track 1, "The Invitation" is a throwaway. The amateurish ukulele plunking makes it seem like it’s going to be a bizzaro indie folk album in spite of the emotive vocals. Things change rapidly on "Other," the best track on the album with a killer hook, a quirky electronic arrangement and strong vocals. "Run" pays some homage to NIN’s "That’s What I Get" (Pretty Hate Machine) in its pacing and dramatic building, but is actually a better song. Things heat up and the claws come out on "Despicable". With venomous chorus lyrics "You’re a waste of my time, you’re a waste of life supreme, you’re just a good for nothin’ fucker causin’ nothing but grief... " you wouldn’t expect from a girl who once had a band in the Dominican Republic called Teen Rock. Oh well, our past often comes back to haunt us, but Lucy isn’t denying her roots. She’s just moved well beyond them. "Stillness" is a four minute instrumental piano composition, with a tone-drone background and a sample & hold synth. It’s sort of atmospheric, and might have been okay as filler on a full length release but is a bit of a letdown on a short EP. "Divine" is a decent enough dramatic piano-based song, but seems out of place with the heart of the material, the three songs in the middle. Kind of Kate Bush-like in flavor. This EP leaves me wanting more- more good material like "Other," "Run," and "Despicable". The good thing is, since it’s available in digital download only, you don’t have to buy the whole CD, just individual songs if you like. Those three are good enough to purchase. It’s tough for an artist to cross genre territories but if Lucy continues with the Elwood Emission project and records more material like the three songs previously mentioned, I think she’ll be getting the recognition she may well deserve. A top-notch producer and a backer with a sack full of green wouldn’t hurt either. After the release of their debut album "Fantasia meccanica", Hidden Place didn't wait too long before starting working on its follow up. They signed a deal with Argentinian label Twilight Records and recently released PUNTO LUCE (translated it could sound like "Spotlight"). The new album dismiss every not electronic sound (you won't find any bass or guitar) and it brings to you nine new songs plus a remix of "United" re-worked by the Argentinian duo NeKrodamus (they have two releases out always on Twilight Records). The play-list is balanced between instrumental and vocal tunes (Sara sings four songs out of nine and the opening "Teknicolor" and "Acrobazie elettriche" have few male vocal lines filtered through a vocoder) and what amazed me is the ability of the band of delivering songs with rich melodic textures and interesting sound patterns. 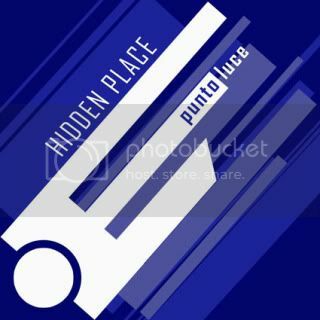 Mixing new wave and electro, Hidden Place with PUNTO LUCE will please the audience thanks to their oneiric atmosphere mid tempo songs influenced by 80s electronic music. Also NeKrodamus' electro e.b.m. version of "United" convinced me and it closes in the right way an album that confirms Hidden Place as a band that deserve a wider exposure. Italoporno is a live electro-rock band made up of six musicians and a live VJ. Instrumentation includes female and male lead vocals, male background vocals, trombone, synthesizers, guitars, bass, acoustic and electronic drums and assorted percussion. Their aim is to drag late-70's hi-energy disco fever back into the club in the form of an energetic live band. STERNFAHRT ZUM URANUS show very well their mission with catchy female vocals synth spacey sounds, guitar riffs and up beat tempos. On the release you can also find three other versions of the song made by Steve Morell (a more electronic version but always true to the original), Juri Gaga (an electro disco remix) and a shorter radio mix of the original. As bonus track you can find "Mc aber - Piet Citrus - lofi space opera mix", a nice electro tune with 8bit like analog sounds. The second single "The fall" sounds like a funky dancey tune always with catchy melodies and upfront bass/drums. The song has also an interesting intermezzo with synth drum pads (like the famous Simmons), brass section and synth solos. The release this time contains an electro remix (NYD - Disco Devil Mix) and a shorter radio edit. Active since the mid nineties, Swedish visual and performance artist Tobias Bernstrup is releasing a new E.P. for Enfant Terrible. Focusing the four tracks of this platter on the Orwellian 1984 theme, Bernstrup is able to conjugate a theme of people control and manipulation with catch and dancey 80s italo disco sounds. If you already know old Bernstrup releases like the 2002 "Re-Animate Me" album, you are already used to his good electro synthpop sound but this time "1984", "Light Years Apart", "Enemies Of The Earth (Space Mix)" and "Data Love" recall me the songs of people like P. Lion, Gazebo or Baltimora with those characteristic choruses and catchy melodies. I really enjoyed this release and you can dig Tobias' music as well his visual art by checking the two paintings of this 12" cover.